3. Pre-filling first and last name: Add ?first_name=a&last_name=b to the end of your link. Replace a with your volunteer's first name and b with your volunteer's last name. 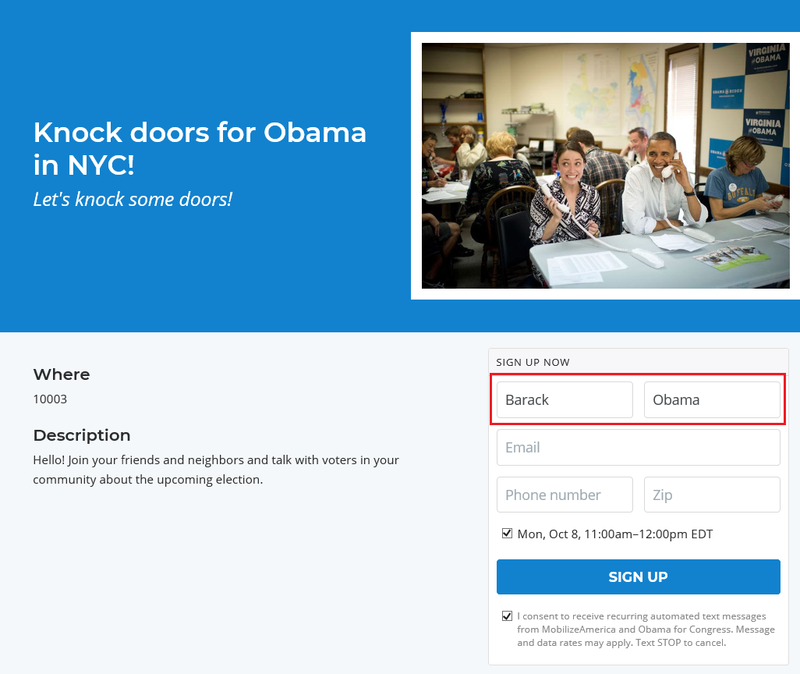 will show my volunteer an event page where their first and last name, Barack Obama, is already entered in the signup form. 4. Pre-filling email address: Add ?email=[email protected] to the end of your link. Replace [email protected] with your volunteer's email address. 5. Pre-filling phone number: Add ?phone=1234567890 to the end of your link. Replace 1234567890 with your volunteer's 10-digit phone number (e.g. incl. area code). 6. Pre-filling zip codes: Add ?zip=12345 to the end of your link. Replace 12345 with your volunteer's 5-digit zip code. 7. You can now send your link via email or SMS to volunteers and direct them to an event page where their information is already filled in, allowing them to sign up for events with just one click. Want to learn more? Here's how you can direct volunteers to a pre-filtered version of your events feed so they only see certain event types, events in a zip code or state, on a specific date / date range, or from a certain organization.